Many federal judges routinely fear criticism, but that fear is unwarranted. The public is rightly concerned that the procedure to investigate and discipline problem-judges is flawed, particularly in a few high-profile cases discussed in this article. Several recent indictments of federal judges add to the problem. As Judge Ralph Winter has acknowledged, the status quo is “not a confidence builder”. Judges should welcome an Inspector General for the Federal Courts, who could restore public confidence in the federal judicial discipline system. The Inspector General can investigate potential ethical violations and proceed in those few instances where more is needed. This solution is something that both the public and the judiciary should welcome. Congress can create an Inspector General with appropriate safeguards that will keep our judiciary independent (because no one favors a dependent judiciary) and will keep our judiciary accountable (because no one favors a judiciary that is above the law). 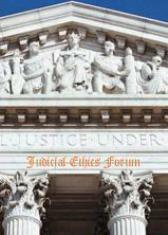 Ronald D. Rotunda, Judicial Transparency, Judicial Ethics, And a Judicial Solution: An Inspector General for the Courts, 41 Loy. U. Chi. L.J. 301 (2009). A link to which can also be found in Articles.